On Sept. 26, the Azerbaijani delegation at the General Debate of the 73rd session of the UN General Assembly made a statement in response to the speech of Armenian Prime Minister Nikol Pashinyan on the Armenia-Azerbaijan conflict and the Nagorno-Karabakh region of Azerbaijan, which has been occupied by Armenia since 1994, Azerbaijan’s Foreign Ministry said in a message Sept. 27. 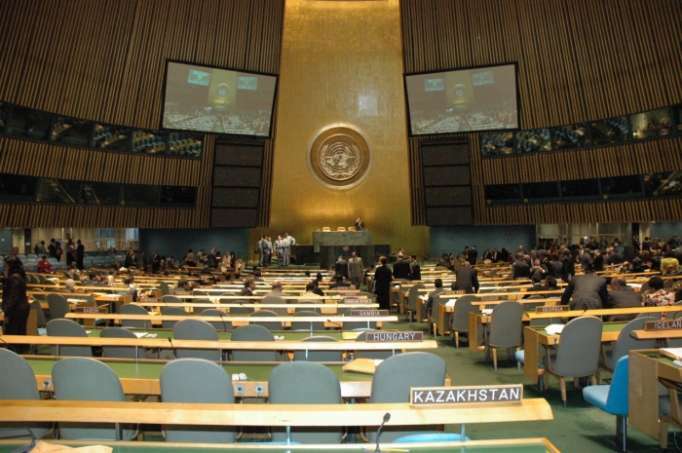 “The initial impression is that the speaker, still under the influence of what he calls “Velvet revolution” and driven by populist and highly contradicting rhetoric, confused the General Assembly of the United Nations with the streets in Gyumri and Yerevan,” reads the statement. “The claims and misinterpretations that we have witnessed in the statement of the Armenian prime minister are particularly astonishing as they sound in the United Nations, whose Security Council adopted four resolutions, condemning the use of force against Azerbaijan and the bombardment and occupation of its territories and reaffirming respect for the sovereignty and territorial integrity of Azerbaijan, the inviolability of international borders and the inadmissibility of the use of force for the acquisition of territory,” reads the statement. “In other words, in the resolutions, the Security Council acknowledged the fact that acts of military force were committed against Azerbaijan; that such acts are unlawful and incompatible with the prohibition of the use of armed force in international relations and in contradiction with the Charter of the United Nations and its purposes; and that they constitute an obvious violation of the sovereignty and territorial integrity of Azerbaijan,” the statement said. Allegations about a new mythical genocide threat against the Armenian people represent another falsehood, according to the statement. “Unlike Armenia, which has implemented a policy of total ethnic cleansing of both its own territory and the occupied territories of Azerbaijan of all non-Armenians, Azerbaijan has preserved its ethnic and cultural diversity to the present day and is a home to tens of thousands of Armenians living in peace, harmony and dignity in the capital city of Baku and other parts of the country,” reads the statement. “The achievement of that objective, which is imperative and not compromise, will create the necessary conditions for addressing other issues with direct, equal and full participation of both communities of the Nagorno-Karabakh region within the constitutional and legal framework of Azerbaijan,” the statement said.